April 13, 1897. Lake Elmo, Minnesota At the clearing, the two witnesses found, impressed in the wet ground, 14 two-foot-long prints, six inches wide, and arranged in an oblong pattern seven on a side. Apparently, these were traces left by the craft. 1927. Fernvale, NSW, Australia A disc-shaped object with dome was seem to light up valleyas it landed one evening. July 9, 1952. Hasselbach, Germany Witness: Oscar Linke. After submitting his testimony to the judge, Linke made the following statement: "I would have thought that both my daughter and I were dreaming if it were not for the following element involved: When the object had disappeared, I went to the place where it had been. I found a circular opening in the ground and it was quite evident that it was freshly dug. It was exactly the same shape as the conical tower. I was then convinced that I was not dreaming." Valenciennes, France Witness: Maruis Dewilde. Dewilde's fear was so evident that Gouchet realized something extraordinary must have taken place, and the next morning his report brought investigators from the Air Police, and the Department of Territorial Security. These teams, along with police investigators, questioned Dewilde and then examined the area where the dark object had rested. They found no footprints in the area, but the ground was very hard. However, they did find five places on three of the wooden ties which had identical impressions, each about 1½ inches square. The marks were fresh and sharply cut, indicating that the wooden ties had been subjected to very great pressure at those five points. At Socorro, New Mexico -- the site where Lonnie Zamora saw a UFO -- investigators found burn marks and impressions in the ground that indicated the presence of strange craft. Witness: Lonnie Zamora. The investigators also examined what looked like landing marks found on the desert floor. In the middle of these marks was a burned area, apparently from the spacecraft's exhaust. March 26, 1965. Everglades, East Fort Myers, Florida. Witness: James Flynn. On March 26, Flynn, Dr. Stipe, and two others, returned to the encounter site in the Everglades, and there found a burned circle some 72 feet across. The circle looked like it had been swept clean of leaves, twigs, limbs -- normal forest debris. Eight cypress trees were scorched from their tops down to about halfway from the ground. The Valensole UFO left behind a deep hole and other traces and affected the surrounding plant life. Witness: Maurice Masse. An oval-shaped structure resting on four legs. In its wake the object left a deep hole and a moist area that soon hardened like concrete. Plants in the vicinity decayed, and analysis found a higher amount of calcium at the landing site than elsewhere. Laboratory study of the affected soil and plants confirmed the occurrence of an unusual event. Witness: Dennis Crowe. Crowe made a report of what he saw, and a geologist came to make an inspection of the landing site. He stated that some type of object had definitely rested where Crowe had seen the UFO. The plant life in the area of the landing was all dying. Indentations, singed brush, and 'purplish liquid' were found at the site. Captain James M. Dorsey, operations officer of the 4621 Air Force Group, supervised the investigation team at the landing site. Project Blue Book unidentified (Case #9806). Testimony of Brigadier General Arthur Exon commander of Wright-Patterson Air Force Base mentioning officers assigned to the Washington, D.C., area that would fly into Wright-Patterson on commercial flights and then deploy on military aircraft to investigate UFO sightings. A case in Arizona where the craft had touched down and left a burned area. These were Project Moon Dust teams engaging in the collection of UFO-related material. Example of a saucer nest of swirled grass where a UFO landed. George Pedley UFO nest encounter, Tully, Queensland, Australia (daylight close encounter with UFO take-off leaving physical evidence UFO nest). Center for Physical Trace Research: Australia, 1966 - A well known case with witness George Pedley. A slightly elongated circular depression remained in the swamp grass, the area measured 32 feet long and 25 feet wide. The grass was flattened clockwise to the surface of the water, reeds had been uprooted from the mud below. 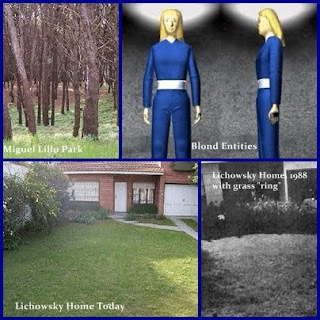 High strangeness report ivestigated by Dr. J. Allen Hynek and Ted R. Phillips. Sketch as seen from barn. Daylight landing, single witness, animal reaction, occupants and object 15 ft away, central shaft, traces. June 13, 1967. Caledonia, Ontario, Canada Three 3- to 4-ft tall beings, light-colored clothing, helmets, moved around beneath cigar-shaped craft with windows; physical traces found at site. Damage to road and bridge. P. Aliranta and E J Sneck. Four landing leg marks and small footprints were left in the snow. Glowing ring taken within minutes of the sighting photographed by Mr. Johnson. Witness Ronald Johnson. Ronald and his parents then went to examine the place at which the object had been first seen. They were astonished to find a glowing ring on the ground, and some sort of glowing material on nearby trees. The ring was still clearly visible thirty-two days later when examined by a UFO investigator named Ted Phillips, who specializes in physical-trace case. Jacques Vallee, claimed in his book Dimensions, a French biologist identified the white fibers in the soil as a fungus-like organism of the order Actinomycetales, whose growth can cause a circular pattern to form on the ground. In addition, this biologist, who asked not to be identified, stated that this fungus is often found growing with another fungus of the order Basidiomysetes, which may fluoresce under some conditions. Allen Hynek meets wth the the James R. family. James G. R. Investigators subsequently found broken tree limbs, crushed foliage, and on some trees burned leaves as high as 35 feet above the ground. In the days ahead more leaves wilted and died. The UFO left imprints two feet deep in the hard ground. Witnesses: Masato Kawano (7 years old) and Katsuhiro Yamahata (7 years old). "[There were] landing traces and ring pattern near broken concrete piles where UFO landed. A schoolteacher found radioactivity within the circular patch. November, 2, 1975 Medford, Minnesota. Ted R. Phillips & J. Allen Hynek During A CE-II Investigation in Medford, MN, 1975. January 6, 1977 Montreal, Quebec Witness: Mrs. Florida Malboeuf. Her son Andre went over to the rooftop in question and found there a large elliptical shaped crust of ice, 0.8 inches thick, and about 18 feet in diameter that was on top of the snow, evidently formed by the local melting of the snow. In relief on this plaque and going toward the façade of the building, were four small, narrow footprints only 6.5 inches long. David F. Webb and Ted Bloecher, HUMCAT: Catalogue of Humanoid Reports, case 1977-01, citing Marc Leduc and Wido Hoville, UFO Quebec. September 18, 1978. Melaria, Porto Nogaro, Italy Witness: Giorgio Filiputti. After the 6 to 8 minutes observation, the witness tried to find somebody to whom to tell what he experienced and he stumbled on a fisherman from the surroundings that he invited to examine the traces left on the ground by the three UFO feet. The traces were about 2 centimeters deep and with "notched" edges. There was no burned surface, perhaps because the ground was a marshy zone mainly covered with sand and mud. The fisherman did not believe the story and supposed that the traces were probably due to gasoline barrels. Then, noticing that the witness was still obviously disturbed, the fisherman convinced him to accompany him to a bar of the nearby Aussa-Corno expressway to have a drink. Report by Antonio Chiumento, in the ufology magazine Flying Saucer Review (FSR), U-K., Volume 28, #5, April 1984. The place is, as a matter of fact, very wooded, and it is not easy to see. Nevertheless, the exact place where it is supposed that the object landed is a rather circular area, where the trees themselves are situated in this curious geometric pattern. The land was relatively soft, due to the rains that had fallen since before November. They found no sign of traces except for a curious footprint, which seemed to have been impressed into the ground many days before. After carefully drawing the mark, they measured it, and its size was 42 cm. (16.5 inches). Several meters (yards) farther on they found two more marks, made in the soil, and they were the same size as the first. The appropriate experiments showed the mark, in proportion to the height, would correspond to an individual some two meters, ten centimeters (6'11") tall. The distance between the marks was about 13 meters (43 feet). Thanks to this field investigation, witness Francisco Lopez Rivero gave certain additional details that allowed investigator Antonio Moya Cerpa to make drawings in his presence that he approved, which are included in this report. Investigators: J. Ignacio Alonso, Joaquin Mateos Nogales, J. Antonio Gutierrez, Manuel FUpo Cabana, and Antonio Moya Cerpa. imana 1:4, pp. 34-35. Vimana is published by: C.I.O.V.E., Rualasal, 22; Santander, Spain. Translation (and slight editing) by Richard W. Heiden. Witness: Bob Taylor. Drummond arranged to meet the police at the clearing. here they found taylor's vehicle and also, as drummond notes, 'marks on the ground which seemed to indicate that something had come vertically down and made impressions in the turf'. these resembled a bulldozer or heavy machinery, but surrounding them were 40 shallow holes that matched the witness's story about the bouncing spiky balls. The police fenced off the area and were utterly baffled, since the tracks covered only this one area of grass. there was no indication of how the vehicle that caused them had arrived. The livingston development corporation... erected a plaque at the forest site commemorating the encounter. it quickly disappeared.., but has been replaced. Witness: George Blackwell. It rose slightly in the air, hovered briefly above an open 10,000-gallon water tank, and then landed 50 feet away. The rancher jumped on a motorcycle and sped toward the object, which was making a "whistling" sound. Suddenly, an "awful scream" sounded as a black tube extended from the UFO's base. With an ear-splitting bang the strange craft rose into the air. A blast of hot air almost knocked the witness down. Where the disc had landed could be found a ring of black, flattened grass 30 feet in diameter. When he examined it in the daylight, the witness discovered that all the yellow flowers within the circle had been removed. Only green grass remained. But even more bizarre, the water tank was empty, with no evidence of spillage. Only the muddy residue at the bottom of the tank was left, and there was something peculiar about even this: It had been pulled into a two-foot-high cone shape. The witness was sick with headaches and nausea for more than a week afterward. A similar ring was found the following December at Bundalaguah, not far from Rosedale. The water in a nearby reservoir was also mysteriously missing. December 29, 1980. Piney Woods, Texas Road damage reported from UFO flames. In both cases – Villa Balnearia and Sociedad Rural – we find very similar characteristics in the marks discovered. Some witnesses at the time were reporting “strange lights in the sky” over Necochea, in the beach and park area, as well as their vicinity. Within the circle investigators later found four depressions in the ground, each about two inches deep and six inches in diameter. The depressions were located at the four points of a diamond-shaped geometric figure. Kelly Cahill. Inside that semicircle was a triangular formation of three points by 6 meters apart which corespond with the tripod configuration drawn by several eye witnesses. The main data we got from the field analysis is chemical changes to the soil, three markings on the ground, that were approximately 75 centimeters in diameter, also we used a special magnetometer on the field itself and we discovered an unusual anomaly on the field that looked like a half moon facing toward the north. There was other things that came from the encounter, was that each of the girls espescially because the men seemed to be isolated from both of their cars but the girls indicated to us that they've been interfered with in some way. And one of the girls called Glinda who is a trained nurse, a registered nurse. She had markings on here which she went to a GEP and the GEP photographed them and consequence we had some very good evidence of a triangle under her naval and a mark in her let inner thigh and a mark on the base of her, down towards her ancle. So their was a lot of good evidence available. Entrimo, Spain The youngsters also claimed having found clearly non-human footprints upon returning the next day; investigators ascertained that the marks corresponded to a creature standing at least 7 feet tall. ET March 7, 1996. Ferrerias, Spain Jose Mannuel Castro, a rancher from the town of Ferrerias, saw a UFO land on his property a mere 100 feet away from his house. Small creatures "looking like monkeys" emerged from the object, and the vehicle left surface impressions and footprints similar to those found at Entrimo. Witness: Lech Chacinski. Once the UFO had departed an imprint of multilple circles could be seen in the field, in which the plants were swirled and flattened--with smaller circles in the same areas relative to the "feet" Chacinski saw beneath the craft. Reported physical evidence cases have also been studied by various private scientist and engineers. For example, researcher Ted Phillips, a protege of J. Allen Hynek at CUFOS, has studied 3200 so-called UFO trace evidence cases typically associated with alleged landings or close interactions. Such traces include such things as tree and foliage damage, vehicle damage, electromagnetic effects, radiation, various residues, footprints, and soil depression, burning, and dessication.